I get an email one day asking about R35 GT-R ECU's. A guy is relaying some information to a guy in New Zealand that has an R35. 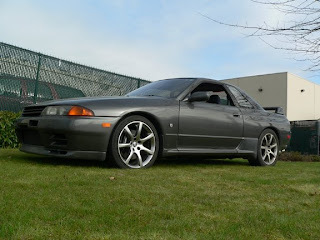 The guy - Mike - also starts asking me some technical questions about an R32 GT-R, tells me he runs a website called Imported Vehicle Owners Association of Canada and that he is planning on running the Targa Newfoundland September 13-20, 2008. He asks me if I want to participate with him. I have been thinking about it. He offered to let me drive if I want. I could either drive or navigate. I have navigated before in Open Road Racing. Watching a computer, and reading out pace notes at 125 mph in a GMC Typhoon. So, I was really thinking about it yesterday. I talked to Mike on the phone for a while. Kind of interesting, he is a Kiwi also. He moved to Canada when he was 7 years old in 1981. I moved to the US in 1980 when I was 5 years old. Thinking about the event. Thinking about the time it takes. Thinking about how much money I will spend to do this. I figure it will cost me about $4k-$5k just to tag along in any capacity. Plane flights, food, lodging, safety gear. Making up for other gaps. Probably a few parts here and there. I ate lunch at Panda Express, and when I opened the fortune cookie, it says " Yes, Do it with confidence." The fortune cookie tells me to do it. And really, who questions a fortune cookie. if only all decisions were so easy to make! my vote Go! for it....and bring me with you. Sure you can come. All you have to do is pay your own way, and find a car to tag along in.